mtn family 100% double data bonus is one of its latest promo that offers subscribers double the data they purchased which valid for 6 solid months, with this promo offer you stand a chance to get more and more data for your pleasant usage for straight six month and i will strictly advice you not to let this pass you over. However there’s a clause with this mtn family 100% double data offer, as it only works on some phones but not to worry, we will provide you with a way round it through which you can also join to enjoy, interestingly you do not need to root your phone, all you need is to download a certain app, then change your current phone IMEI to that of the phone eligible for the offer then zoom you are good to go. Its quite simple, when you purchase data of 1.5GB for N1000, you will be rewarded with an extra 1.5GB, making a total of 3GB, similarly, if you subscribe for 3.5GB for N2000, you will get extra 3.5GB, making a total of 7GB just like that. 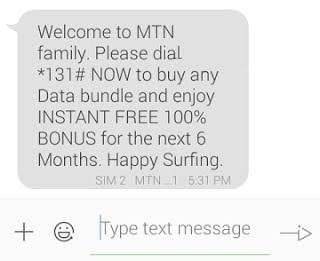 this is similar to the mtn 7gb offer that was made available sometimes ago. First thing you need to do is tweak any listed below IMEIs, thereafter you proceed to change your phone imei to the one you just tweaked. After a successful change, kindly wait for mtn confirmation message welcoming you to the family, but if after few mins no msg, you can restart your phone, once you then receive the msg, the next thing to do is to migrate to MTN BetaTalk by dialing *123*2*6# or BT to 132, then you can now proceed to subscribe for any of the mtn data plan and get your own 100% double data bonus.